A meniscus tear is a common knee injury. The location and severity of your tear will determine if you need to have surgery. Surgery or not, though, you need to follow some basic initial treatments to get your recovery started on the right track. Below you will find information on the different types of torn meniscus, initial treatment approaches, and surgical options. A torn meniscus usually occurs with a twisting type of injury to your knee. It is very common to have a meniscal tear along with other injuries such as a torn ACL or MCL sprain. The meniscus is a piece of fibrocartilage that sits between your femur and tibia, and helps to absorb shock and stress in your knee. With twisting type motions, your meniscus can be torn, causing significant pain and swelling. You may hear or feel a pop with injury, and your knee may feel like it catches or needs to pop. 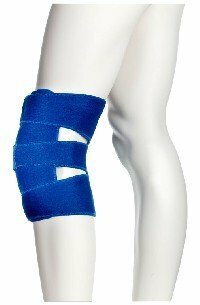 The initial care for your torn meniscus centers around the R.I.C.E. 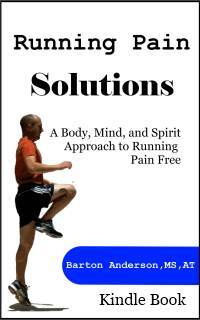 Principles of rest, ice, compression, and elevation. If you have significant pain and swelling, you should see your certified athletic trainer or family physician for evaluation. Your physician or athletic trainer will perform a clinical exam, including specific tests to determine if you meniscus may be torn. Two common tests are the McMurray's test and Apley's Compression and Distraction tests. With a history of how you injured your knee, how quickly it swelled, location of your pain, and other symptoms they should be able to determine your exact injury. Your physician may also recommend an MRI for the most accurate diagnosis. Along with R.I.C.E., you can also work on keeping your quadriceps strong, and improving your range of motion following injury. This can be done with quad sets, straight leg raises, and heel slides. These exercises will help reduce swelling and pain, as well as improve your range of motion. Your certified athletic trainer or physician will should provide you with exercises to perform after your initial evaluation. Your meniscus is made up of two C shaped pieces of fibrocartilage. They are named by their position, either medial or lateral. 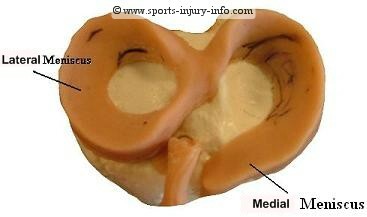 The medial meniscus is closer to the inside of the body, while the lateral meniscus is located towards the outside. You may also hear the term "horn" when your physician describes the meniscus. This refers to the corners of the "C", either towards the back (posterior) or front (anterior). Depending on the force of the injury, several types of tears can occur. Longitudinal tears involve a vertical tear along the length of the meniscus. Longitudinal tears can also become "bucket handle tears", depending on the extent of the tear. Radial tears are another type of meniscus tear. These occur along the inside border of the meniscus. Significant radial tears can produce a flap tear, or "parrot beak tear", in which a flap of the meniscus may actually be moving into the joint space. This can often cause the catching or clicking feelings associated with meniscus tears. While some meniscus injuries may not require surgery, because of the poor blood supply of the meniscus, many tears do require arthroscopic surgery. When considering surgical procedures, you may have the option for either a meniscectomy, or removal of the torn areas of the meniscus, or a mensicus repair. The location of the tear, and the size of the tear will determine which option is best for you. Your physician will not be able to tell if a repair is possible until he begins the procedure and can examine the meniscus with the arthroscope. Treating tears in your meniscus starts with controlling the initial swelling and pain. This is best accomplished with rest, ice, compression, and elevation. Following an evaluation with your certified athletic trainer or physician, you can begin working on simple exercises to regain your range of motion and decrease swelling. Even with proper rehabilitation, some meniscus tears require arthroscopic surgery, because you may continue to have clicking, catching, popping, or swelling even after rehab. If you think you have suffered a meniscus tear, or have significant pain and swelling, talk with your physician or certified athletic trainer.